Docuseek has a new look! But if you prefer the classic Docuseek interface, that's doable. You choose. After twenty years of devastating pollution produced by oil companies in the Amazon basin of Ecuador, a new kind of oil company - Dallas based MAXUS - promises to be the first company to protect the rainforest, and respect the people who live there. 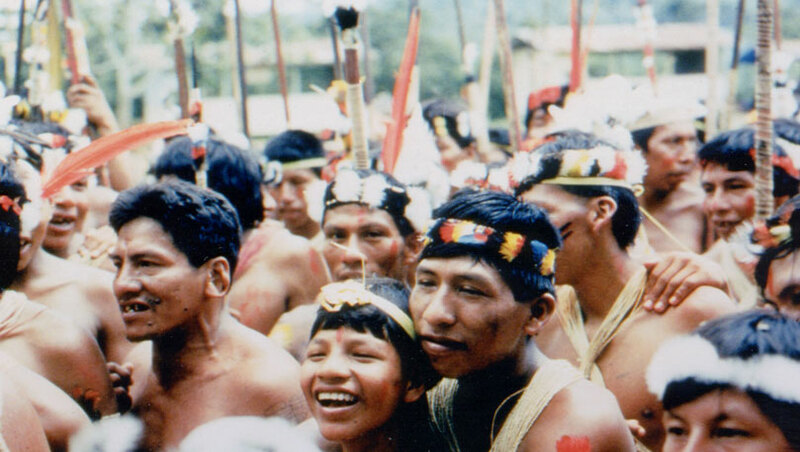 TRINKETS and BEADS tells the story of how MAXUS set out to convince the Huaorani - known as the fiercest tribe in the Amazon - to allow drilling on their land. It is a story that starts in 1957 with the Huaorani massacre of five American missionaries, moving through the evangelization efforts of Rachel Saint, to the pollution of Huaorani lands by Texaco and Shell, and then the manipulation of Huaorani leaders by MAXUS. Filmed over two years, TRINKETS and BEADS reveals the funny, heartbreaking and thrilling story of the battle waged by indigenous people to preserve their way of life. The story of how the Huaorani are attempting to survive the Petroleum Age on their own terms exposes hidden consequences of our relentless drive to 'develop' the world. Photography, Tony Avirgan, Gordon Durnin; editor, David Fox; music, Ian Hill. Existing customers, please log in to view this film.